Its All About The Pork! Have you noticed that you can get bacon flavoured everything now. From ice cream, donuts, soft drinks, coffee, in addition to hamburgers, hotdogs, pizza, and many more. Bacon is not just for breakfast anymore. Even the mention of the word bacon makes many people drool. And bacon is not the only pork that is promoted off the charts. Pull-pork, something that I hadn’t heard of 10 years ago, is now everywhere also. Pull-pork burgers, fries, ice cream (again), etc are all mainstream parts of the food industry. But what if I told you that the pig is not only one of the most disgusting animals in the world, but that God actually forbids its consumption? Don’t get me wrong, I enjoyed pork for most of my life, and the smell of bacon cooking still causes me to drool a little, but I no longer have pork in my diet, along with a number of other unclean foods that are forbidden to eat. And God doesn’t forbid the consumption just because He wants to, there are major health concerns associated with the consumption of unclean foods. This did create (and still does) a major dilemna for me as I began my journey to Christ. PORK TASTES GOOD!!!! And that is no accident. Satan wants to lead us away from God and puts temptation everywhere. Even Jesus was tempted by Satan, three times and He was able to resist, so if we want to be like Jesus, we must resist temptation also. Since Satan knows that man loves the taste of pork, he uses his power to influence his angels to introduce it into as many places as possible in an attempt to corrupt as many of God’s people as possible. But we must be strong and resist temptation or else Satan will win. In the book of Leviticus (Old Testament book #3) God tells us about clean and unclean foods. Leviticus 11 lists the animals and characteristics that are clean and unclean. Some animals are specifically mentioned, while others are only identified by their various characteristics. The lists is too exhaustive to go into in great detail here, but among the forbidden (unclean) foods are pig, shellfish (crabs, lobster, clams, etc), scavengers (of any kind), lizards, frogs, and on and on. Many of the items on the list you would not even consider as a food item, but the whole list should be on your “do not consume” list. Looking at some of the reasons, if an animal scavenges for food from other dead animals, then anything that animal eats goes into the flesh. If you eat the flesh of a scavenger, you risk being poisoned by whatever it has eaten. Some of the animals are just general disease carriers or have very poor health habits themselves and therefore could pass the diseases along to you. Others were just never made to be eaten, but Satan brought them forth through his angels and man was convinced, just as Eve was deceived by Satan in the Garden of Eden (Genesis 3). When I first considered becoming Seventh Day Adventist, the dietary laws were a real struggle for me. I loved to eat the forbidden foods, and there were more opportunities all the time. But as I became more educated about the reasons for the restrictions, it all made sense, and with God’s help and prayers, I was (for the most part) able to overcome the temptations and leave unclean foods alone. Notice that the pigs have little room for themselves, that they’re in constant contact with the other animals, they live and sleep in feces, and all diseases go very quickly through the herd. In addition, most commercial pigs are raised completely inside without ever seeing sunlight, which could help to prevent diseases. 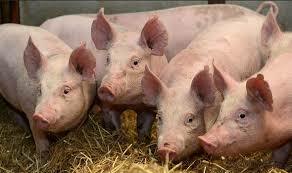 Pigs are fed in ways to induce quick growth to allow for more production. All of this together creates a nightmare of problems for consumers. The demand for pork in some countries is so vast, that its hard to keep up with demand. In China they build huge 30 story apartment blocks to raise 100’s of thousands of animals in one place. The future of humans is in great danger with this mass production and consumption of such an unclean animal. God never wanted us to consume these foods, He specifically laid it out in His laws, but Satan corrupts everything good in an attempt to win us over. Don’t fall into his trap, read the truth and make yourself healthier for it. I’m now going to make a special appeal. If you or a family member suffers from mental health issues and you’d like to share your story (anonymously), please use the form below. All information will be kept confidential and will not be shared with anyone. My goal is to set up a resource for people who are reaching out for help. You can be part of the solution and maybe save a life.